Becca took to Instagram a few times this past week to document how she's packing her belongings and saying goodbye to Minneapolis, MN, to start a new life with her fiance in California. On Thursday, Becca, 28, took a selfie in which stacks of cardboard boxes could be seen filling the room behind her. "FedEx is apparently my new bestie and I'm having a really hard time parting with my mini microwave tv," Becca captioned the photo. Becca also shared a video to her Instagram Stories, showing how she was using a vacuum-sealed storage bag for her clothing. "Whoever invented space bags is a genius and I need to shake their hand," Becca joked. Earlier this week, Becca shared a sentimental post on Instagram about her big move and revealed Garrett, a 29-year-old medical sales representative, is her rock. "I've been sick and packing all week for our big move and decided I needed a pick-me-up break. I was going through all my old pics and came across this one from our very first photo shoot together," Becca captioned a photo of Garrett kissing her on the head. "It was right before our finale and I was SO excited and anxious to finally be able to share our news with the world. But even in the midst of craziness, this man kept me chill and let me know everything would be okay." "He still does just that. I need him right now when I'm body deep in boxes and packing tape. You're my calm place @gy_yrigoyen." The former publicist then confirmed in the picture's comments she and Garrett are both headed to California. "Can't wait for the move!" added Garrett, who currently resides in Reno, NV. "3 more weeks and it will be our place to call home together!" Garrett also recently asked his followers on Instagram where he can go hiking around San Diego, CA. Garrett revealed there's no place he'd rather be than the mountains, so he was looking for a tip on where he could explore. 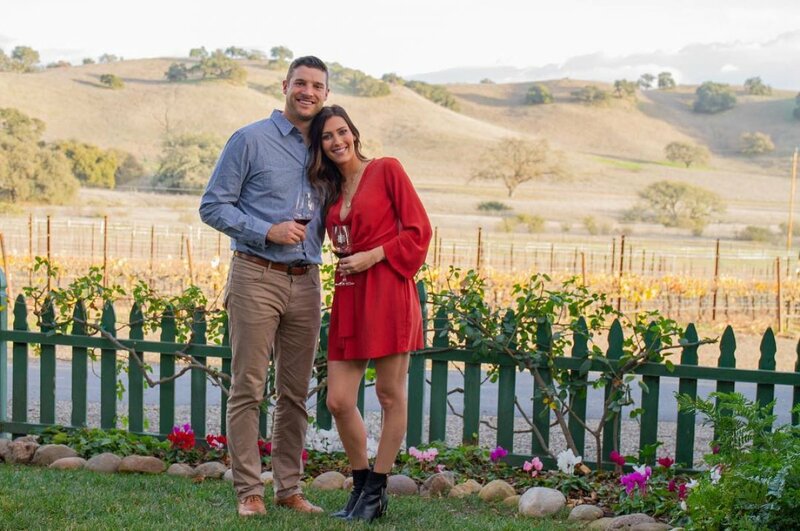 Becca and Garrett got engaged on The Bachelorette's fourteenth season in August 2018. Becca told the press the following month she and Garrett were looking forward to settling down and planting roots once they could agree on a place to live. The pair had been thinking about Minnesota, Nevada or California. Becca later admitted to Us Weekly in December that the couple "honestly" didn't "have any" wedding plans. "No dates, no months, no venue," Becca told Us at the time. "I would say the fall of whatever year we choose," Garrett chimed in, "because she loves the fall." Prior to starring on The Bachelorette, Becca competed for Arie Luyendyk Jr.'s heart on The Bachelor's 22nd season last year. Arie and Becca got engaged during the season finale, but weeks later, the pro racing driver decided to dump Becca and beg his runner-up, Lauren Burnham, to take him back. Arie and Lauren got engaged in March 2018 and tied the knot in Hawaii on January 12, 2019. They are currently expecting their first child together, a baby girl.